David Malindine is based in Ealing, West London where he works with his wife Christine as a private tutor, author and publisher for his own company Tutor Master Services. After graduating with a BA Honours Degree from University College London. David completed his PGCE (Post Graduate Certificate in Education) awarded by Southampton University Department of Education. A successful seven years teaching in Harrow led to David being awarded a one year, full time paid secondment to study for an MA (Master of Arts) at the London Institute of Education. Having successfully achieved the MA qualification, David returned to Harrow to continue his teaching career. Having always been interested in studying the ways that children learn, David was promoted, by Christine Gilbert (later to become Head of OFSTED) to the post of Deputy in the Learning Development Department, an exciting position in a school that was at the forefront of curriculum development. David helped lead a team that sought to improve student achievement in two key ways. Firstly, to work with students in class to improve their learning experiences and secondly, working with teachers across all curriculum areas to improve the way subjects were taught and to ensure that lessons were clear and accessible for all children and learning potential was maximised. Working with teachers in all subject areas provided David with a unique insight into the types of difficulties students encountered with learning and more importantly led to the development of strategies and approaches that could help to overcome these difficulties. As well as playing a leading role in working with teachers and students, David took the opportunity to follow courses in professional development and training. The most significant of these was the three-year course for the Advanced Diploma in Special Needs awarded by the Open University. David graduated with Distinction grades in all three-core units. This formal academic training plus practical school based experience provided David with a thorough understanding of the challenges that face children as they learn, particularly gifted children and those for whom learning is a challenge. Having followed a one-year course, David's most recent qualification was the award of the RSA Certificate for teaching students with Specific Learning Difficulties (Dyslexia). After 19 successful years teaching in the State sector, David left to become a self-employed private tutor teaching maths and English. Working with small groups of students David has been able to deploy his wealth of educational experience and expertise for the benefit of his students. During the years since 1999 David has been very successful in improving the learning for hundreds of students and has had notable success with students taking Common Entrance, 11+ and SATs examinations. To view the roll of honour of students tutored successfully by Tutor Master click here. Working as a private tutor helping to prepare students for examinations has given David useful insights into areas of the curriculum where there is a deficit of educational materials to help aid students with their preparation. A particular area of concern expressed by both parents and students was the fact that story writing was difficult, especially when the family background was one where English was not the first language. To help meet the need expressed David wrote and self published the book Tutor Master helps you Write Stories Book One. This book aims to assist children of all ages and abilities by identifying the key 'Ingredients for a good story', some background on 'Parts of Speech - the jobs that words do in sentences' plus 20 story plans that provide a structure for students to use to develop their own ideas. Tutor Master helps you Write Stories Book Two was published in 2007 and builds on the ideas contained in the first book. Advice is given on the key areas that examiners are looking for when assessing students. These key areas include the ability to write speech correctly punctuated, expression of feelings of the story's characters, plus good description using adjectives and adverbs. Using different and imaginative writing styles can make stories eye catching and readable and ideas for starting sentences in different ways are provided for students to use. Tutor Master helps you Write Stories Book One and Tutor Master helps you Write Stories Book Two were trialled extensively with students before being published. Both students and parents have been delighted at the self-confidence developed by young writers as they use the story plans to steadily improve their story writing skills. Many hundreds of students have gained success in 11+ examinations, Common Entrance examinations and examinations to Independent and Private schools using these books to help improve their story writing skills. Child friendly and easy to use, these books encourage independent learning for children. Popular with parents, children and teachers, students quickly gain confidence with writing by using the helpful and structured story plans. Tutor Master helps you Learn English – A Literacy Dictionary was written to improve understanding of words to do with the English language and literacy for students aged 9 years and older. Aiming to promote personalised learning this book is easy to use, helpful and student friendly and supports teaching and learning for students of primary age upwards. By providing a quick and easy to use source of reference for interesting, unusual, and frequently misunderstood words to do with English language and literacy, this book is useful for not only students but parents, teachers and lecturers too. Comprehension - the ability to read and make meaning from written information is crucial for students of all ages. Comprehension skills are tested in schools from age 5 upwards and continue throughout education and training into adulthood. Through his work as a private tutor David was alerted to the fact that there was a lack of realistic examination papers that parents and students could use to practise for entrance examinations at aged 11+. 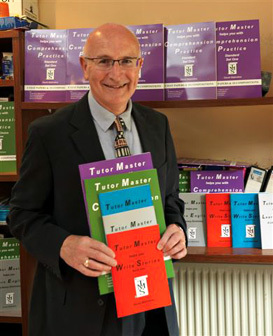 In order to provide students with papers to assist their examination preparations, David has written and published two books Tutor Master helps you with Comprehension Practice - Standard Set One & Tutor Master helps you with Comprehension Practice – Multiple Choice Set One. In addition, David has written four Introductory books Tutor Master helps you with Comprehension Practice – Multiple Choice Introductory Set One , Tutor Master helps you with Comprehension Practice – Multiple Choice Introductory Set Two & Tutor Master helps you with Comprehension Practice Standard Introductory Set One , Tutor Master Helps You with Comprehension Practice - Standard Introductory Set Two to enable younger children to begin to practise the skills needed to master multiple choice comprehension. When children move from primary school to secondary school at the end of Year 6 (aged10/11) some parents may wish their child to take examinations in order to achieve a place at a grammar or independent/private school. Tutor Master publications support students, parents and teachers at this crucial time by providing structured, easy to use and child friendly resources that promote independent learning and help develop confidence. Tutor Master Books provide revision and practice for both standard comprehension and multiple choice comprehension tests using the two books Tutor Master helps you with Comprehension Practice – Standard Set One & Tutor Master helps you with Comprehension Practice – Multiple Choice Set One. For younger children beginning comprehension, ideal preparation is given by Tutor Master helps you with Comprehension Practice - Multiple Choice Introductory Set One, Tutor Master helps you with Comprehension Practice - Multiple Choice Introductory Set Two, Tutor Master helps you with Comprehension Practice - Standard Introductory Set One & Tutor Master helps you with Comprehension Practice - Standard Introductory Set Two. Copyright © 2019 Tutor Master Services. All rights reserved. parentsintouch.co.uk Resources, advice and educational materials for students of all ages.